Synopsis: Vera Bellington has beauty, pedigree, and a penthouse at The Angelus--the most coveted address on Park Avenue. But behind the sparkling social whirl, Vera is living a life of quiet desperation. Her days are an unbroken loop of empty, champagne-soaked socializing, while her nights are silent and cold, spent waiting alone in her cavernous apartment for a husband who seldom comes home. Then Emil Hallan arrives at The Angelus to paint a mural above its glittering subterranean pool. The handsome French artist moves into the building, shrouds his work in secrecy, and piques Vera's curiosity, especially when the painter keeps dodging questions about his past. Is he the man he claims to be? Even as she finds herself increasingly drawn to Hallan's warmth and passion, Vera can't suppress her suspicions. After all, she has plenty of secrets, too--and some of them involve art forgers like her bold, artistically talented former friend, Bea, who years ago, at Vassar, brought Vera to the brink of catastrophe and social exile. When the dangerous mysteries of Emil's past are revealed, Vera faces an impossible choice--whether to cling to her familiar world of privilege and propriety or to risk her future with the enigmatic man who has taken her heart. A Fine Imitation explores what happens when we realize that the life we've always led is not the life we want to have. A Fine Imitation" is many things - a romance, a study of loneliness, an examination of social expectations and much more. 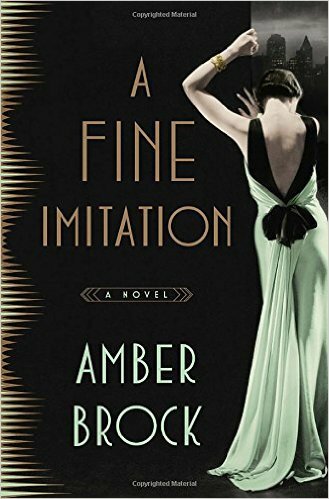 Set in the 1920's in New York, we are introduced to a socialite whose husband is so busy she feels abandoned, bored, lonely. The story unfolds with a narrative that switches between current time and the protagonists earlier life as a college student. There are some fascinating characters too - a dull husband obsessed with his work, a strict overbearing mother, and a mysteriously handsome but eccentric artist. Most of all, there is a hidden theme that all that glitters is not gold and that often we find ourselves leading lives according to others and not of our own devise. A great, thought-provoking novel that gathers momentum as the story moves along. An excellent recommendation for women's book clubs.